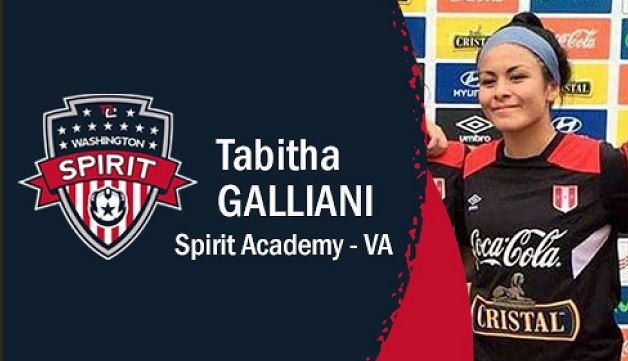 Boyds, MD (January 10, 2018) – Washington Spirit – Academy Virginia U-16/17 player Tabitha Galliani has been named to the Peru U-20 Women’s National Team roster for the South American Women’s Football Championship, which kicks off Saturday, January 13 in Argentina. Peru will compete alongside host nation Argentina, Colombia, Paraguay and Ecuador in Group A of the opening stage. Galliani and her Peruvian teammates will open the tournament on Monday, January 15 against Argentina (5 p.m. ET), before taking on Colombia on Wednesday (5 p.m. ET), followed by a match-up with Paraguay on Friday (5 p.m ET), before finishing out Group A competition on Sunday, January 21 against Ecuador (7:15 p.m ET). During the inaugural U.S. Soccer Girls’ Development Academy season, Galliani helped the Spirit Academy – Virginia U-16/17 team compile an 8-6-2 record during the fall 2017 portion of the schedule, which is good for the No. 8 Wildcard position in the playoff race heading into the spring. Galliani appeared in 10 games for the Spirit Academy – Virginia U-16/17s in the fall, starting six and scoring one goal. She has been a regular in the Peru Youth National Team system, most recently participating in a December 2017 training camp with the U-20 squad.